I appreciate Garry giving me a chance to write this column. I’m going to fill the all-important niche of writer who knows less about football than Kevin Bruce and has none of the inside information of Garry Paskwietz. I hope you enjoy it. I plan to be writing it for the next 15 years. Let’s start with a couple of thoughts on the tumultuous off-season. But did USC really follow the Brian Kelly example? I’m not convinced. Kelly fired just about everybody who had ever set foot in the ND football office and a few people who had only considered going inside. He hired a new O coordinator, a new D coordinator, a new special teams coach, and a new strength-and-conditioning coach. He replaced 17 members of the ND football staff in all. (https://www.si.com/college-football/2017/03/08/brian-kelly-notre-dame-fighting-irish-changes) Like Apollo Creed before him, Kelly retired more men than Social Security that off-season. USC did not come close to making such a clean start. Helton retained his strength-and-conditioning coach, his special teams coordinator, his defensive coordinator, and some position coaches. We can argue whether those are good retentions, but it seems beyond dispute that USC is tinkering around the edges rather than tearing the structure down to its foundation and re-building. The question is why. 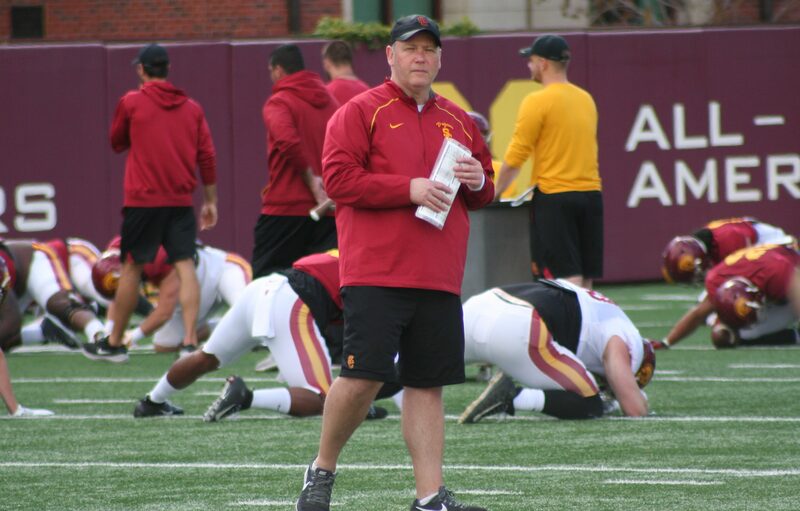 Clay was given a second chance that very few USC coaches would have received, and he’s chosen to stick with many of the same guys and schemes that have led him to the precipice of disaster. Based on Clay’s off-season quotes about how USC was on the doorstep of competing for a national title, I can only assume he thought he had this thing figured out and was completely caught by surprise at his year’s results. The question is whether this surprise would jar him into making significant changes in the program or whether he thinks the original plan was sound, the program is on the right track, and this past season was just an anomaly. Lynn Swann’s statement would support the former explanation; Clay’s decision to retain so many of his coaches seems to support the latter. We’ll see more when practices start, I suppose, but it appears Clay believes wholesale changes are unnecessary. And if that’s his position, I suspect there’s a good chance he’ll be looking for an O coordinator position for himself soon. And unlike Kliff Kingsbury, I don’t think his phone will be ringing off the hook. Second, let’s talk about the major change of the offseason. Look, I may not be the son of an O line coach, but I’m still a power football kind of guy. The Air Raid was made for programs that can’t push their opponents around. 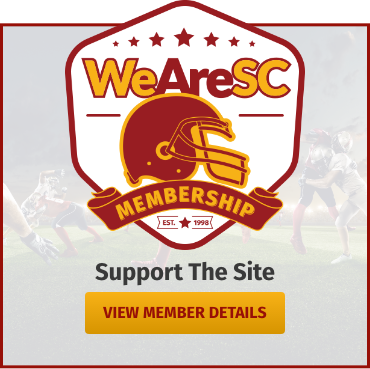 USC is a program that can out-recruit most of the country – certainly all of the rest of the Pac 12 – and should be able to play a more physical, more traditional style of offense. This is not the direction I wanted USC to go. And let’s be clear: this is 180 degrees away from what Clay Helton promised when he was hired. If Clay Helton said he wanted to turn USC into Texas Tech West, he never would have landed the job. I do like competence. Competence would be a nice change, as USC hasn’t been running a competent offense for some time. The talent in the trenches is a question mark, but USC recruits skill-position talent with the best of them. Yet we haven’t seen USC scheme those athletes into favorable matchups. USC doesn’t scheme guys open. USC doesn’t often use its play calling to set up the defense for big plays late in the game. The truth is that USC doesn’t even play good, disciplined football on the offensive side of the ball much of the time. So am I happy about Kliff Kingsbury? Yes. This is not what I wanted. But I also didn’t want 5-7, and unless the offense is handed to a real pro, I think 5-7 or worse is a likely outcome next year. And Kingsbury is a real pro. He’s out of work because his defenses couldn’t stop anybody. But he can develop QB’s, and he can move the ball and score points. 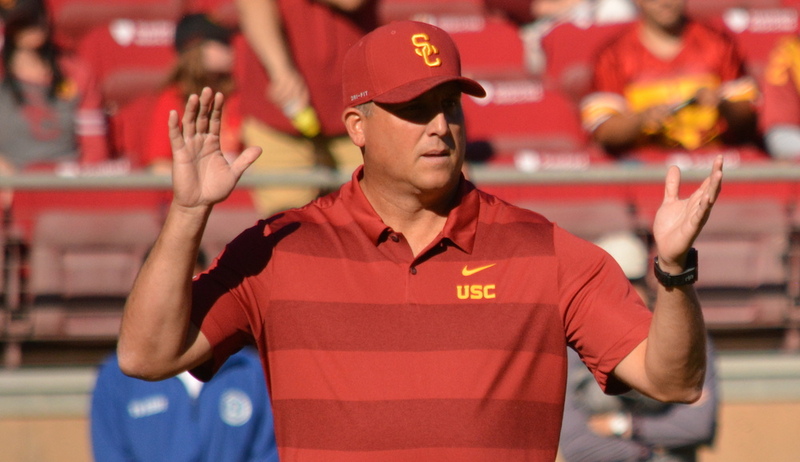 There’s a good chance USC will make adjustments on offense next year. There’s a good chance USC will score points after halftime. These are welcome changes. And let’s face it: the Trojans’ current personnel is more suited to this style of offense. USC’s O line and TE’s aren’t pushing anybody around next year. There are a lot of good receivers and pass-catching backs on the roster. And either of the young QB’s will thrive in this system. This assumes, of course, that Kingsbury will be given the freedom to do what he wants with the offense. I suspect he will, because there was no reason for him to take this job offer if Clay was going to meddle. This means that Kingsbury gives USC its best chance of being explosive on offense next year and winning football games. It’s not what I wanted … but it beats the alternative. So good job, Clay. Good job, Lynn. Let’s end with a feature I call Trojan Game of the Past. September 29, 1984. LSU versus USC at the Coliseum. The first one probably doesn’t register high on many lists; it’s not Bush Push or the ’74 comeback. It was dreadful, actually. LSU running back Dalton Hilliard ran for a thousand yards and the Tigers crushed USC. It was ugly. It was also the day I fell in love with USC football. I had watched games on TV with my dad prior to that day. But we were living in Kansas, and I had never attended a USC game. We moved back to Southern California in the summer of ’84, and this was my first visit to the Coliseum. The season got better, of course. We watched USC beat #1 Washington at the Coliseum and then Ohio State in the Rose Bowl. (Don’t ask about ND and UCLA.) I’ve seen better USC games. I’ve seen better USC teams. But I’ll never forget that first USC football game. I’ve had lots of interests come and go over the years. 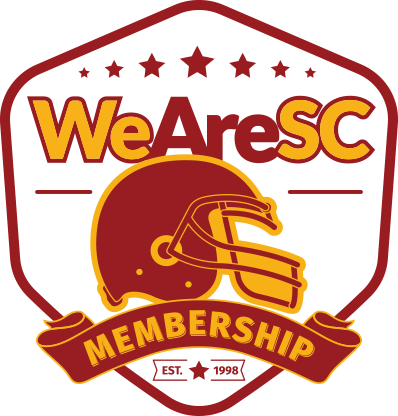 But nothing has or will take away my love for USC football – not Paul Hackett, not Max Nikias, not Pat Haden, not the current owner of a Very Set Jaw. It is one of the few constants in my life. Chris Arledge is a graduate of USC’s Gould School of Law and is the co-founder and managing partner of an intellectual property law firm. Chris’s forgettable football career started at Elsinore High School, where his Tigers defeated Kyle Wachholtz’s Norco squad for the league title (Bring on Brad Otton’s team, too! ), and ended at William Jewell College, where Chris was a team captain and an all-conference defensive back.